The Schwarze® A9 Monsoon™ is a heavy-duty, chassis mounted, regenerative air street sweeper with a 9.6 cubic yard hopper. 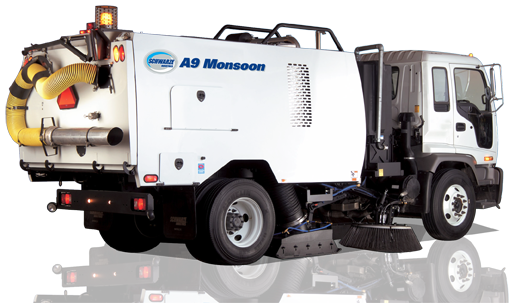 The A9 Monsoon™ has over 20 years of successful operation throughout the United States and around the world. 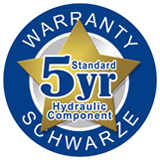 From a hydraulic system designed with just-in-time principles to insure clean, fresh fittings to a saw tooth drop-down screen design, the Monsoon™ is designed to work more and be down for maintenance less. 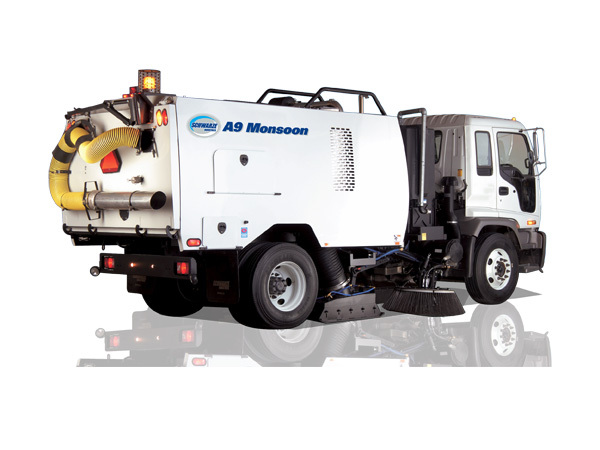 The A9 Monsoon™ is a heavy-duty workhorse that will provide a high quality option with a low cost of ownership. Come to the people you know, for the products you trust. Four Point Protection℠: Optional Stainless Steel Hopper Package for long-lasting performance. 140 HP John Deere Increased productivity with more horsepower. 9.6 Cubic Yard Hopper Capacity Increased hopper capacity equates to increased production and less dumps .